Summary: Sage Czinski is trying really hard to be perfect. If she manages it, people won’t peer beyond the surface, or ask hard questions about her past. She’s learned to substitute causes for relationships, and it’s working just fine… until Shane Cavendish strolls into her math class. He’s a little antisocial, a lot beautiful, and everything she never knew she always wanted. This was my first Ann Aquirre book and I was all pumped up and excited because I've heard nothing but awesome-sauce reviews about her paranormal series Enclave. This is Agguire's first dip into the contemporary world and while the writing was great, it just didn't do it for me. I have been on a contemporary bender for several months but this one made me fall back into paranormal lit. 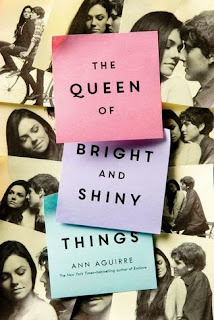 I really loved the concept behind the title and cover of the book... sticky notes. I thought it was really clever how they identify with the main character Sage. The idea of building walls between people by using kind, simple, written compliments was brilliant and the reactions from the receivers was heartfelt. This is NOT a bad read, it was just too easy for my taste. I do think that a high school-age audience will get into it a bit better than I did. The main characters had tragic pasts and serious high school drama that did give me #thefeels at times. I just kept waiting for the bomb to drop and when I realized that it had, it was just handled to simply. If you are looking for an easy, contemporary read about two kids with crap-tastic parents and their struggle to find their place in the world, then this is a good read. AudioHaNoi.Com chuyen cung cap Loa Karaoke Gia Dinh chinh hang, giá tot.